As everyone knows, the protection against atmospheric over voltages requires installing surge protectors the more upstream (as “main”) as possible of the low voltage electrical installation. This is in order to drive the power of lightning to the ground and avoid it spreading downstream. A good image of the phenomenon of total internal reflection is a wave (representing the voltage wave, the height of the wave representing the voltage amplitude) which arrives on a wall: the wave comes crashing against the wall by doubling its height and goes back in the opposite direction. 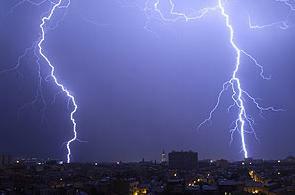 What is the best solution for a guaranteed lightning protection? or copy this trackback: http://engineering.electrical-equipment.org/electrical-distribution/lv-coordination-2-surge-protectors.html/trackback from your own site. your blog added in two above link. ı think its a very useful method. Good information. Thanks for sharing. The graphic is a nice illustration and the information about adding a second down-stream protector is most helpful. I want as u about installation lightning protection. ant install Electrode in to the earth. Surge protection devices is more useful now days, it will protect from the thrunder to keep human safe. You are right. 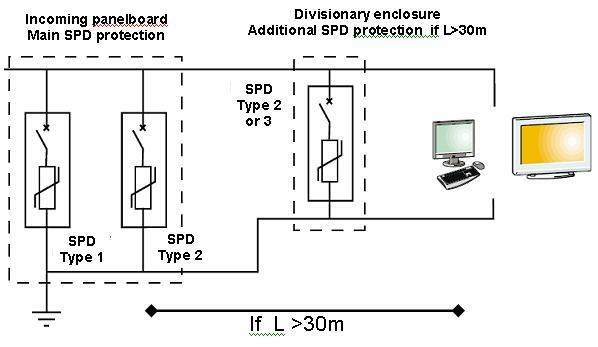 Because of this phenomenal the lightning protection standard IEC 62305 part 4 shows the protection cascades by test class 1 SPD at main entrance board to protect against direct and nearby lightning strokes test wave form 10/350µs, to discharge the main energy (discharge current Iimp) and reduce the voltage to max Up < 4kV (insulation protection) …….a class II SPD with Up < 2,5kV in the subdistribution board (TVSS protection) and last not least an voltage limiting class III SPD near to equipment (as near as possible to the equipment to be protected max 6m ) to limit the supply voltage to < 1,5kV resp. to < 1kV for sensitive equipments. LEUTRON has a special patented no aging GDT-spark gap SPD…PowerPro BCD …family with a Up of < 1kV at 25kA 10/350µs per pole, which after a distance of 10m between SPD and equipment srill keep the Up value of 10m a voltage limiting SPD with Up < 1kV (at 3-5kA 8/20µs and voltage test 1,2/50µs at Uoc=6kV) of test class III (IEC 61643-11) is sufficient to install at the equipment to protect. If you staudy the IEC standards and if you understand the background of it, you will not have a problem to plane the best suitable protection system. but take attention that the UL and ANSI standard take care only to limit voltages (TVSS) but do not take care of the high amount of impulse discharge current form 10/350µs happens at SPD in the main entrance board . MOV SPDs can not discharge such high energy because ot he very high thermal stress of max total 100kA 10/350µs, which can enter via ground in the electric system via the EBB . This is srinivas, thanks for your post. 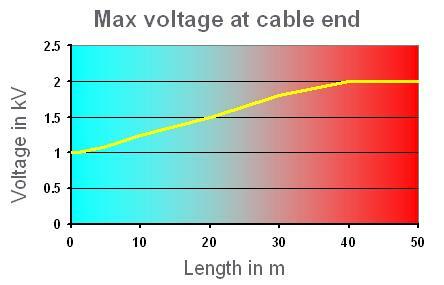 If it is a industrial plant or factory it’s ok it is applicable because all of the cable are running outside. So is there lightning strikes the cable it will passed through that. But how it is applicable to residential and commercial buildings. Incoming service lines we are providing Class B+C SPD, how the internal equipment will get the effect from TVSS.